Right around eight a.m. in the morning, two hundred thirty seven years ago, George Washington and the Continental Army reached the outskirts of Trenton, New Jersey. Much like today, no-one wanted to go to New Jersey, but were forced by circumstances to make the arduous trek. Washington’s force of 2,400 men surprised, and ultimately defeated, the 1,400 Hessian mercenaries who were fighting on behalf of the British Crown. A much needed win was tallied under the Patriot’s side of the scoreboard, emboldening the Continental Army and our quest for freedom. By the end of the battle at Trenton, four Americans had lost their lives. 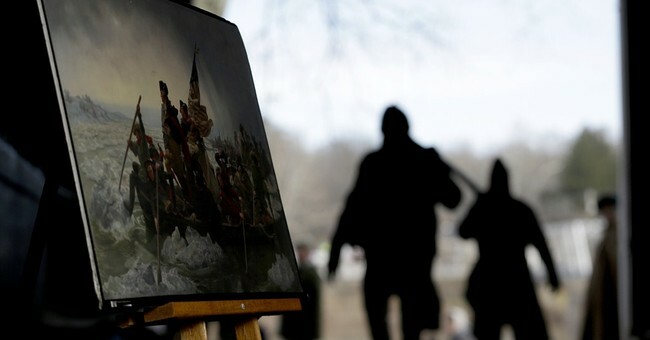 Over a thousand Hessians were captured. And while Washington was unable to hold onto the town (he had no artillery), the victory bore tremendous significance for the freedom of the colonies. In New Jersey, on December 26th in the year 1776, George Washington and his men cemented the concept of American exceptionalism and dedication to freedom. The historical event is worth a few minutes of recollection as we trudge toward 2014 with an increasingly apparent devolution of freedom in America. After all, in the days of our founding, a simple tax on our breakfast beverage resulted in massive protests in Boston Harbor – and ultimately a few gunshots. Our founders were tired of being ruled by a body of “representatives” hundreds of miles away. They were fed up with the dictatorial nature of King George’s executive action, and disregard for individual property rights. Imagine living in a land where one man in the executive branch could unilaterally alter law… It’s not that hard to imagine, is it? And while many things have changed since 1776 (although the government’s inability to build a website has clearly remained unchanged in 200 plus years) there are many similarities in politics, societal concerns, and the struggle for liberty. The latter half of the 18th century saw some incredible shifts in how the world functioned, and how commerce commenced within the new world. As much as anything else, it was the changing times that propelled American patriots to a victory over the powerful British Empire. The lesson should not be lost on ardent supporters of freedom in the 21st century. Freedom, and the cause of Liberty, will never be extinguished entirely, as is evidenced by Washington’s under-dog victory against a group of drunken mercenaries in New Jersey. And while freedoms may seem in jeopardy on a regular basis today, the sacrifices and tenacity of Washington and his men have allowed us to live in a world where freedom is no longer a farfetched concept. In fact, thanks to the ragged farmers and laborers who overthrew a hung-over force of Hessian mercenaries, we now live in a world where freedom and liberty are still experienced in relative abundance. The bad news, on this anniversary of the battle of Trenton, is that many of us are still regulated and taxed by unaccountable officials a world away from where we live. Having bureaucrats in DC decide to regulate or tax based on other bureaucrat’s recommendations, after all, is not that different than the British Crown implementing law without the consent of the governed. Of course, it’s also a bonus that making a trip to New Jersey is not a requisite to fighting for freedom on this December 27th.